Normally I'm not one to indulge in retail therapy, but after a hugely stressful [for me!] day I decided to explore IKEA and have some almond cake and coffee in the restaurant! Given we lived in almost a dozen houses before we finished school, my sister and I spent a disproportionate amount of our childhoods wandering around with our parents at IKEA. Buying new furniture was often cheaper than having movers send existing stuff thousands of kilometres, and the apartments and houses we moved into in Sydney, Melbourne, Brisbane, Singapore and Kuala Lumpur were all different sizes and dimensions which necessitated buying different things to fit. Going to IKEA now is like a step back into my childhood and that excitement I used to feel as we sketched out our plans for my bedroom using those teeny weeny pencils. That smell of fresh pine and the fact IKEA pretty much looks the same no matter which city or country you're in also brings back memories! Except the ones in Damansara and Tampines, thoes outlets are monsterous! Now that I'm older I appreciate going there on a different level, I love meandering around this gigantic maze filled with ingeniously designed paraphernalia with cool Swedish names. That a company could make something like furniture accessible and fun to someone with as much design sense as me (read: none!) is no small achievement. After wandering around for a while and having a free cup of coffee from the restaurant (I'm an "IKEA Family" member!) 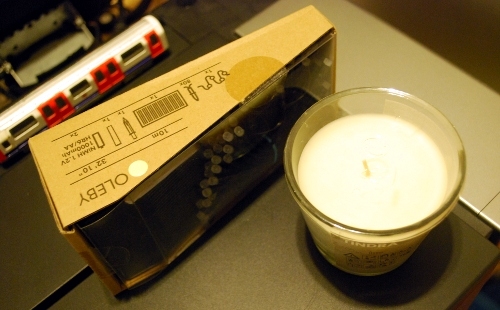 I got a gigantic string of solar-charged battery LEDs to string across the ceiling of my SOHO, and a candle with what appeared to be cheesecake on it, but made the room smell like pudding. Normally I find such things too sickly sweet, but this one is very mild and inviting, particularly on cold winter nights like this ^_^. I'd never taken the train to IKEA before, but the swanky upgraded Rhodes station on the Northern line is just a block away, and there's even a dedicated path away from road traffic leading to the entrance. As is customary, weblog posts typically finish at the end. In this ending, for you entertainment I enclose one picture from a display I saw at IKEA this afternoon. 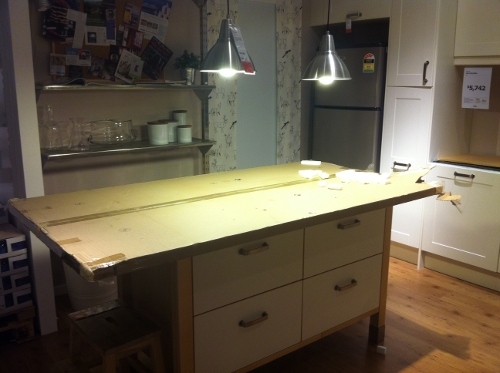 If you have some unfinished/unbuilt IKEA wares in your home, don't worry! Even the professionals sometimes don't get around to it ;).